HA NOI (VNS) — The health of two patients in Viet Duc Hospital, who received liver and heart transplants from a brain-dead patient in HCM City's Cho Ray Hospital on Friday, is improving. Doctors at Viet Duc Hospital said the patients -- both male, aged 60 and 40 and suffering from liver cancer and dilated cardiomyopathy -- start eating liquid food yesterday afternoon. Dr Du Thi Ngoc Thu, head of the Cho Ray Hospital Organ Transplantation Unit, said as soon as the relatives of the donor, who was declared brain dead after an accident, agreed to donate his organs, the hospital informed the national organ transplant unit. The donated organs were the liver, heart and the two kidneys, which were used to save the lives of two patients in Ha Noi and two in HCM City's Cho Ray Hospital, Thu said. 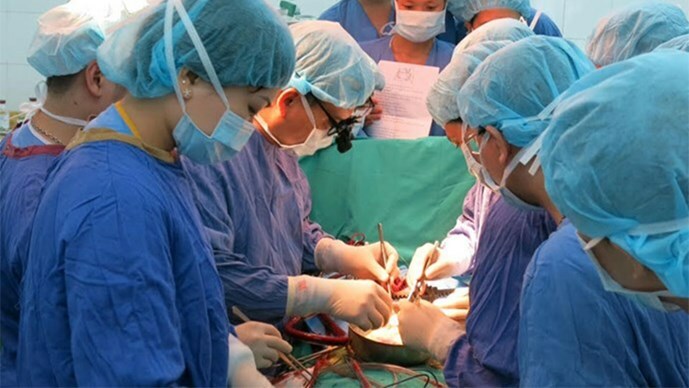 After receiving the information on Friday, Viet Duc Hospital surgeons travelled 1,700 km from Ha Noi to HCM City to collect the donated organs and returned the same day, as the transplant operations had to be conducted within eight to 10 hours of the organs being harvested. The heart transplant surgery lasted six and a half hours, while the liver transplant took seven and a half hours. The Cho Ray Hospital Organ Transplantation Unit, operational since October 2014, has helped to save 20 patients after five brain-dead patients donated their organs.